optomap Retinal Examinations ("optomap"), provide eye-care practitioners with clinically useful information that facilitates the early detection of disorders and diseases evidenced in the retina. Optos' core product is the retinal image produced by the Panoramic200 Scanning Laser Ophthalmoscope device: the optomap retinal image. The optomap retinal image gives eye-care professionals a much larger view (200 degrees) of the back of the eye your retina than conventional eye exam equipment. The images can be taken without dilating your pupils a very common procedure which is uncomfortable and inconvenient for many people. The optomap image is captured in less than a second and is immediately available for doctor and patient to review. 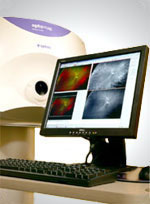 The optomap Retinal Exam offers many clinical, practice and patient benefits. Patient can resume normal activities immediately.